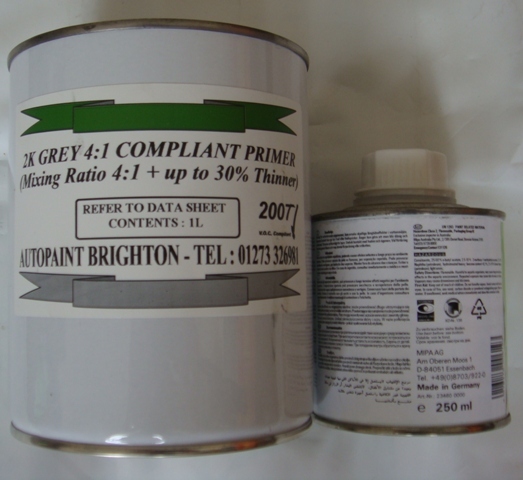 2 Pack 2K Grey Primer Kit 1L & 250ml Activator / Hardener. High build 2K primer with outstanding filling power for all types of paints (synthetics - single coat or base coat). It is cured with an isocyanate based BODY HARDENER (FAST - NORMAL - SLOW) @ 4:1 ratio . It can be diluted up to 30% with thinner (reducer) BODY ACRYL ( NORMAL - SLOW). Quick drying and easy to sand. Suppled with 250ml Activator.